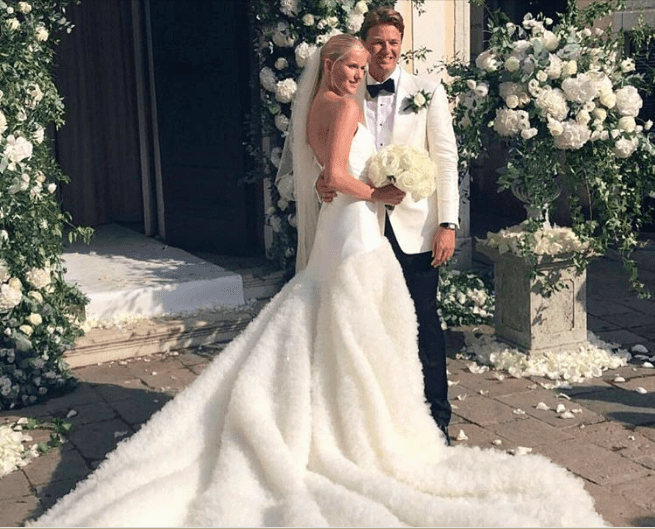 When the Norwegian-born interior designer, Phoebe Hveem, got engaged to her longtime boyfriend, Peder, the two were on a romantic trip in the middle of Florence. They knew immediately that they wanted to have their wedding somewhere in Italy, but the process of planning a wedding is often arduous. Phoebe realized she would both have to decide on a location as well as find a dress. Surprisingly, the location became easier to find. After considering several different, but equally magical, locations in Italy, the couple ultimately decided that a Venetian wedding was calling them, and they began to plan their nuptials in the midst of the twisting alleys that dot Venice’s many canals. At the same time, Phoebe kicked her search for a dress into high gear, mostly by following every single wedding designer she could find on Instagram. It seemed like a stroke of magic that she managed to find her dress that way. With a simple bodice, the dress made its full statement with the extended tulle skirt that drifted behind the bride while she walked down the aisle. “It was hard to walk in at the time, I had to have a lot of help,” Phoebe joked to the magazine. “But luckily the skirt was quite light and the material was such that I wasn’t afraid of it getting wrinkles or getting it dirty.” In contrast with the vintage setting, the modern dress made for an epic wedding statement.